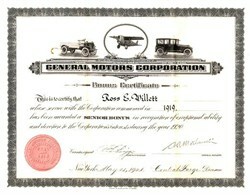 Beautifully engraved SCARE certificate from the General Motors Corporation issued in 1920 awarding 12 shares of stock. This historic document was printed by American Banknote Company and has an ornate border around it with a vignette of a 1 1/4 Ton Samson, Dayton Wright Monoplane and a Buick Model 21-50 Sedan. This item is hand signed by the General Manager, A. A. Motherwell and Bonus Custodian, R. Briggs is over 85 years old. Paperclip mark on left side of vignette, otherwise EF. The certificate was issued to Ross Willett who lived in Detroit Michigan as part of a Senior Bonus Plan for the year 1920. Included with the certificate is a letter describing the Bonus Plan and a registered mail envelope. This is one of the first (if not the first) formal equity bonus plans implemented in the United States. The program was implemented to compete against the Ford Motor Company. The program obviously worked. This is the first time we have seen this certificate for sale.